Tomorrow's a busy day for matters astronomical since in addition to the equinox there's also a full moon, writes Ian Griffin. At precisely 10.58am, the centre of the sun crosses the celestial equator heading north during its apparent annual journey around the sky. This is the exact moment of the southern hemisphere autumnal equinox, with day and night being roughly equal in length wherever you live on Earth. Tomorrow is a busy day for matters astronomical since in addition to the equinox there's also a full moon. Our closest neighbour in space is full at 2.43pm. This means that, weather permitting, moonrise (here in Dunedin this will occur at 8.17pm) will be spectacular. To my mind, there are few more beautiful sights in the heavens than seeing a bright full moon low in the sky. If you are a keen photographer, and want to get a half-decent picture of the moon rising, you need to find yourself a location with an unobstructed eastern horizon and set up in plenty of time for the main event. For the real photography nerds out there, the actual azimuth (compass direction) of moonrise will be 85 degrees tomorrow night, so the moon will emerge slightly to the left of due east. Light from the 99.6%-illuminated moon will wash out most of the dimmer stars in the sky, but if you are out and about, you can use the moon as a guide to finding some of the brighter stars in a rather interesting part of the sky. The moon is in the constellation Virgo, and roughly five degrees (that's the angle subtended by your three middle fingers held at arm's length) to the left of the moon you should be able to pick out the star Porrima, named for the Roman goddess of prophecy. Along with Auva, Heze and the vivid blue-white star Spica, Porrima makes up the body of the constellation. 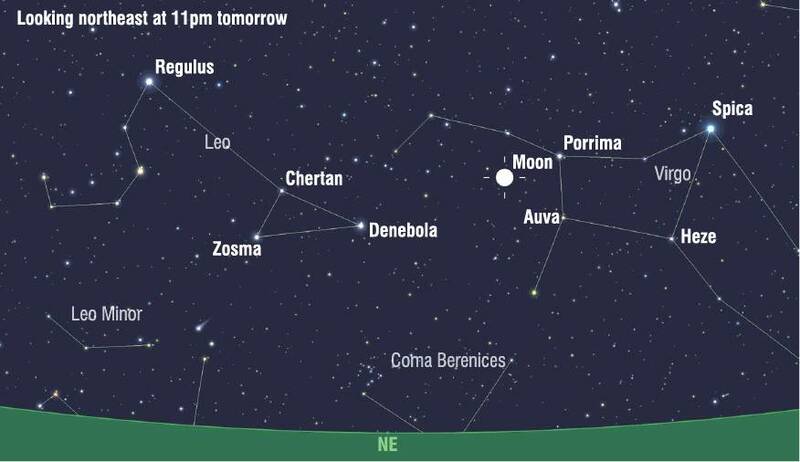 To the left of the moon, is the constellation of Leo, and even in intense moonlight, you should be able to pick out the bright triangle made by the stars Denebola, Zosma, and Chertan, which represent the hindquarters and tail of the celestial lion.